Inspired by some of the most memorable and iconic models from our past, Yamaha’s Sport Heritage range is proving to be a major success with those riders who appreciate their unique formula that blends timeless style with a very special character and sophisticated engine and chassis technology. By harnessing the retro appeal of Yamaha models from a previous generation – and at the same time creating minimalist, contemporary high-tech motorcycles that deliver linear torque with agile handling for a connected and emotional riding experience – we’re enabling today’s Yamaha customers to discover the true essence of motorcycling. We call it our Faster Sons philosophy, and this refreshing approach to motorcycle design has attracted riders of all ages and backgrounds to the Sport Heritage line. Yamaha’s Faster Sons design philosophy has struck a chord with many thousands of riders who appreciate not only the timeless design of our Sport Heritage models, but also their ability to put every rider in touch with their surroundings, and make every single ride so enjoyable. This ability to re-connect today’s riders with the essential joys of motorcycling is a key characteristic of every Yamaha Sport Heritage model, and the latest European sales figures show just how many riders have been inspired by the XSR700 and XSR900. Between 2015 and 2017 over 11,000 riders became proud owners of a new XSR700, making it one of the most successful models in its category. With its outstanding linear torque, agile handling, attractive looks and remarkable economy and value, the XSR700 is the definitive mid sized naked retro. Its remarkable success within Europe has created massive interest amongst the press and public in the USA, and for 2018 the XSR700 will be launched in the United States – where it looks like it’s going to be one of Yamaha’s best selling models. Introduced in 2016 – one year after its smaller brother – the remarkable XSR900 has also enjoyed considerable success. In just two years this 3-cylinder Sport Heritage bike has sold over 7500 units in Europe, and has been widely praised for its special combination of strong linear torque, sporty handling and timeless good looks. The XSR900 has also been a major success in the USA, where it has won over a whole new generation of riders who are looking for authentic retro design together with thrilling performance and cutting edge electronics such as TCS, YCC-T and D-MODE. For 2018 the best selling XSR700 acknowledges its roots with a bold new colour scheme that pays tribute to the iconic XS650 – the bike that started Yamaha’s 4-stroke revolution, and one of the most important and iconic models in Yamaha’s history. Introduced back in 1968 – before many of today’s XSR700 riders were born – the XS650 has huge significance as Yamaha’s first 4-stroke motorcycle. With its advanced 654cc SOHC parallel twin design, class-leading reliability and high power output, the XS650 gained a loyal following in Europe and the USA – and there are still many dedicated XS owners clubs in existence today. Marketed variously as the XS650, XS1, XS2 and XS650 Special during its 17-year production run, it established Yamaha as a major brand in the 4-stroke sector – at a time when the company was predominantly seen a 2-stroke manufacturer. As well as its immense popularity with street riders, the XS650 also made a great impression in the racing world. The XS650 engine powered Kenny Roberts to the 1973 AMA Grand National Dirt Track Championship in the USA – and it was also the dominant force in Sidecarcross, winning four consecutive World Championships between 1980 and 1984. From January 2018 the XSR700 will be available in a new Brilliant Red colour option that pays homage to the 1972 XS2. 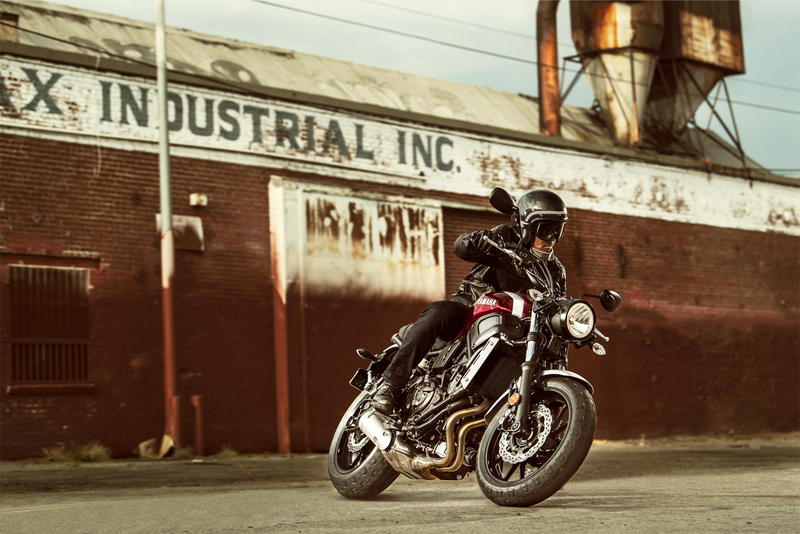 Just like the original XS650 model, the XSR700 features a parallel twin engine that delivers strong linear torque for outstanding riding enjoyment. Some 46 years after Yamaha first used this this evocative colour scheme, the Brilliant Red XSR700 recaptures the true spirit of our original parallel twin 4-stroke. An excellent example of our Faster Sons philosophy in action! From November the XSR900 will be available with a new Racing Red colour option that’s reminiscent of the colour scheme used on the original XS850 back in the 1980s. Inspired by the Yard Built motorcycles that Yamaha has created in cooperation with world famous motorcycle customizers over the last few years, Yamaha has developed a range of high quality Sport Heritage Genuine Accessories for the XSR700 and XSR900, enabling every customer to build their very own Yamaha Yard Built motorcycle. The extensive line up features many performance parts including high and low levelAkrapovičexhaust systems, as well as Öhlins rear shocks and fork springs for enhanced handling. XSR owners looking for the ultimate in riding comfort can choose from a selection of seats and screens, and a range of stylistic bolt on accessories such as seat cowls and billet covers are also available. There’s a diverse selection of soft luggage that looks great and increases the XSR’s carrying capacity – and the Genuine Accessories line up also includes many lightweight billet components and other items that are designed to enhance the style of these charismatic Sport Heritage models. Using the My Garage app, XSR owners and potential customers can create their dream bike online with our easy to use 3D configurator. Just click and customize, and see what works best for you! We’ve developed a range of cool casual wear designed for XSR owners. Legendary bike builder Roland Sands is responsible for the design of many of these shirts, jackets and caps. The range also includes open face helmet with a cool retro look, as well as riding jackets, gloves and more. Available in a wide range of sizes, male and female.